This year Amsterdam will welcome many new residents. People who fled their country and who have found a safe shelter in our city. These newcomers will have to find their place in our society and we are keen to help them. 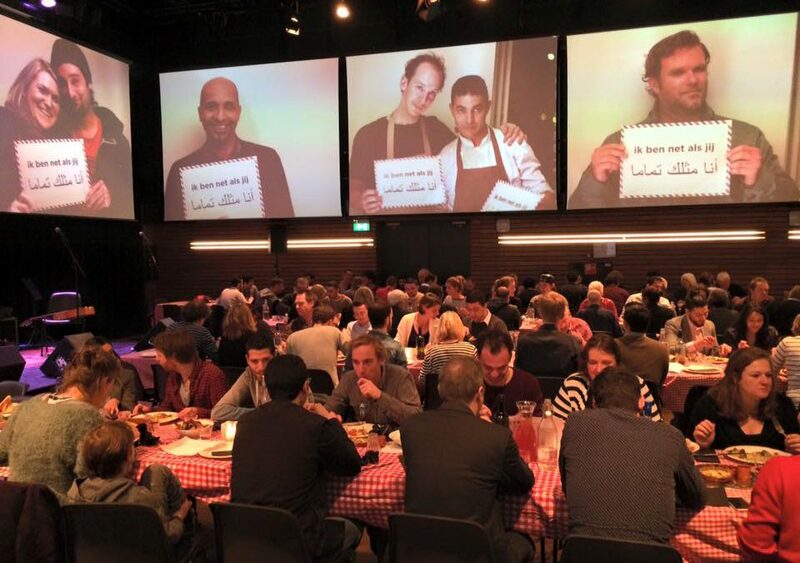 Join this informal dinner where you get the chance to meet (new) Amsterdammers. The newcomers in our country bring all kinds of talents, knowledge and skills. The wish and the skills to build a new life are often there, but what’s often missing is a network. This is where the locals come in; they have the opportunity to enrich and share their network on this evening. Dinner is offered for free and newcomers will get 5 euro’s to cover their travel expenses. We strive to an equal participation of locals and new Amsterdammers. If you subscribe, you will receive a final confirmation. If you’re not selected, do not despair. We organize this event on a regular basis, so you will be sure of a seat at our dinner table next time. The next edition of Eat to Meet will be in September. If you have any questions, suggestions or comments on this evening, please send an email to Simone (simone@dezwijger.nl). This facebook group is for everyone who want to meet again after the eat to meet dinners!